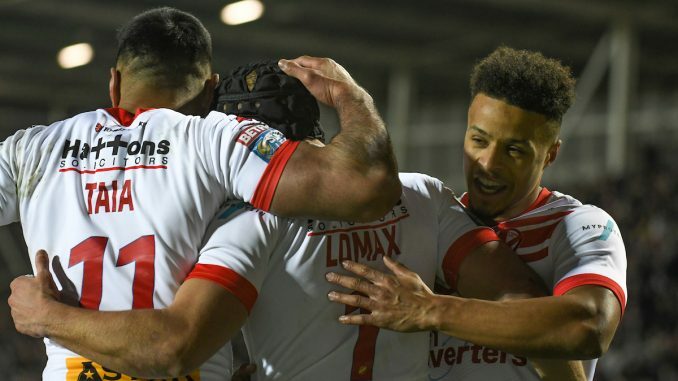 St Helens came from being behind to claim a 27-22 victory against a dogged Leeds side and maintain their unbeaten start to the season. Saints sit joint top of the Super League table alongside Warrington Wolves, who have also won three games out of three. Justin Holbrook named an unchanged St Helens team to the one that beat Wakefield Trinity last time out. Danny Richardson and James Bentley were the two players who missed out on the final matchday squad. Rhinos coach Dave Furner made two changes to his outfit that won at Salford Red Devils last time out. Liam Sutcliffe and Mikolaj Oledzki returned in place of injured duo Matt Parcell and James Donaldson. Saints were dealt a hammer blow in the first two minutes as star signing Kevin Naiqama left the field and failed to return with concussion. The hosts took an early 10-0 lead at the Totally Wicked Stadium thanks to Theo Fages and Jonny Lomax. But after a shaky opening 10 minutes, Leeds clicked into gear and Kallum Watkins, Konrad Hurrell, Ash Handley and Oledzki went over to give the Rhinos a fine 22-10 lead at half-time. Rhinos back-rower Stevie Ward left the action in the first half with a knee injury and failed to make it back on the field. St Helens came out of the sheds in good form, with Alex Walmsley powering his way over for a double, before fellow front-rower Luke Thompson also went over for Saints. And with a minute left on the clock, Saints’ cult hero James Roby kicked a drop-goal to secure a 27-22 win for his side in what was an entertaining showdown. Walmsley, Roby and Thompson were magnificent in the front-row for St Helens and they really drained the life out of the Rhinos at times in the second half. It’s a nice reward for Walmsley, who spent most of the season on the sidelines in 2018 with a neck injury. He might have bagged a brace within second half minutes, but it was his carries that were most impressive. He makes at least 10 metres with every drive. As for Roby, what more can be said about him? He’s like a fine wine. He’s an incredible player, who will forever be regarded as a legend in St Helens. Thompson is set to make the Super League Dream Team again this year if his performances continue. Saints centre Naiqama took a knock to the head in a tackle just over a minute into the game and he was a big loss to Holbrook’s side in attack and defence. He was replaced by Ireland international Louie McCarthy-Scarsbrook. As much as McCarthy-Scarsbrook is a hard-worker, he is not a centre and doesn’t have the flair that Naiqama has. In defence, tries from Handley and Hurrell in the first half came on the side Naiqama would’ve been on and he would’ve been able to handle powerhouse Hurrell better than the likes of Fages and Tommy Makinson. Teams are always going to miss their stars, and Saints missed him. The Rhinos might have started in an apprehensive manor, but they were brilliant when they started to throw the ball about and get it to their backline. Watkins and Briscoe on the right edge made countless metres between them and Hurrell and Handley’s large frames proved too much to deal with for the Saints at times. It’s still very early days for the new era at Leeds, but they need to be given time to really hit their potential. They continue to show glimpses of their capabilities in attack, but they would admit they need to touch up their defensive sharpness. St Helens: Coote (7); Makinson (7), Naiqama (5), Percival (6), Grace (8); Lomax (8), Fages (7); Walmsley (9), Roby (9), Thompson (8), Taia (7), Peyroux (7), Knowles (9). Subs: Paulo (7), McCarthy-Scarsbrook (6), Amor (6), Lees (8). Leeds: Walker (7); Briscoe (8), Watkins (8), Hurrell (9), Handley (7); Lolohea (8), Myler (6); Merrin (7), Dwyer (7), Peteru (7), Ferres (6), Sutcliffe (5), Ward (5). Subs: Cuthbertson (7), Singleton (6), Smith (6), Oledzki (8). St Helens didn’t play to their best by any means but the old cliché is ‘it’s a sign of a champion team when they are winning but aren’t playing to their best’, or something like that anyway. Saints’ pack will be crucial to them winning silverware this year. Players like Morgan Knowles and Matty Lees are unsung heroes for the club, and let’s not forget to mention strong-runners in Dom Peyroux and Zeb Taia. Moving on, Leeds can be proud of their performance and they are improving week on week. They had Saints on the ropes in the first half but just leaked one too many tries through the middle. Hurrell is a beast of a player and the more Leeds can get the ball to him, the better. Warrington Wolves continued their winning start to the season with a 32-20 win against Huddersfield Giants at the John Smith’s Stadium. Ben Murdoch-Masila, Blake Austin, Ryan Atkins (2) and Josh Charnley (2) all crossed the whitewash for the Wolves.